Write-Host "Setting cost center tag on " $volumes.Count " volumes"
You will need the AWS Tools for Windows Powershell installed. Amazon EC2 just keeps getting better (and cheaper). They are constantly improving capabilities and tools to make what used to hard easy. Yesterday, I had to upgrade the test database server as part of a story to improve the performance of our web application. The DBA had put the database server on a high-memory extra large instance (m2.xlarge) without realizing that that instance type offers what Amazon calls “moderate I/O”. That instance type has highly variable I/O performance, which caused quite of bit of frustration during demos and tests. My job for this story was to eliminate the I/O variability so users would see good, consistent performance under normal conditions. The environment in question is not used for load testing so the server did not have to be sized for full production loads. I estimated this would take a two to four hours of time. Much of the time would be spent waiting for updates and SQL Server to install. Using this procedure, it took me about 30 minutes to upgrade the server. Let’s run through the steps in more detail. Use SQL Server Management Studio to backup the databases locally. Zip the backups and use the EC2 Management Console to move the zip to an S3 bucket. 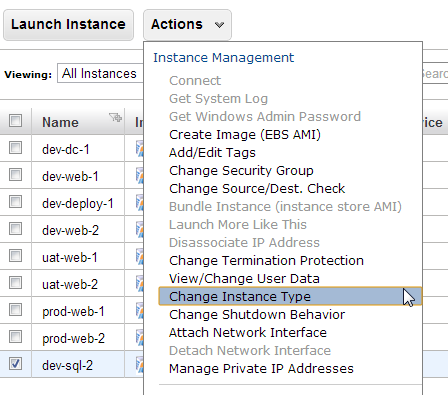 Select the instance in the EC2 Management Console and use the Action menu to stop the instance. 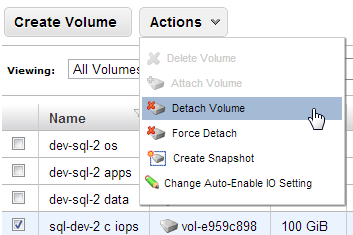 Select Volumes in the left-hand menu in the EC2 Management Console. Select your volume and record the zone and attachment information shown in the lower-right portion of the screen. 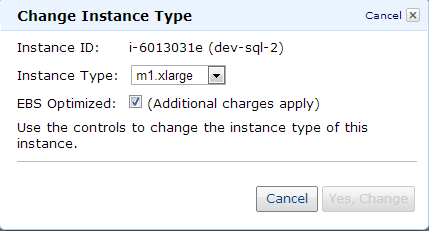 Go to the EC2 Management Console, select the instance, pull down the action menu and select “Change Instance Type”. In the Change Instance Type dialog, set the appropriate instance type and check the box to supported provisioned IOPS on the instance. Press the “Yes, Change” button to upgrade the instance. Select Volumes in the left-hand menu in the EC2 Management Console. Select your volume, pull down the Action menu and select “Create Snapshot”. Create the snapshot with a meaningful name. 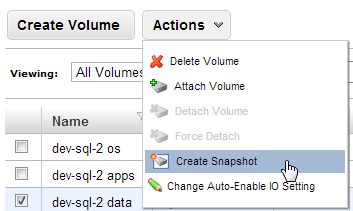 Select Snapshots in the left-hand menu in the EC2 Management Console. Search for the name of the snapshot you created in the previous step. Select the snapshot and click on the “Create Volume” button. This pops up the “Create Volume” dialog. Select the desired IOPS level. Note that IOPS cannot exceed ten times your volume size in gigabytes and must not exceed the maximum IOPS allowed for the instance type (e.g 1000 for m1.xlarge). 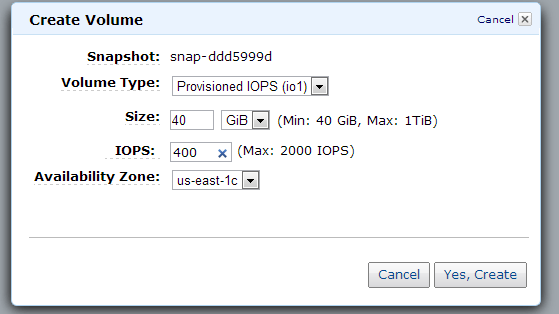 For example, the maximum provisioned IOPS for the 40GB drive in this example is 400. You can increase the size of the volume if you need a greater level of provisioned IOPS. Windows will see any additional space on the volume as unallocated. Set the availability zone to the one your recorded from the original volume settings. Press “Yes, Create” to create the volume. Select Volumes in the left-hand menu in the EC2 Management Console. Select your old volume, pull down the Action menu and select “Detach Volume”. Select Volumes in the left-hand menu in the EC2 Management Console. Select your new volume, pull down the Action menu and select “Attach Volume” to bring up the “Attach Volume” dialog.